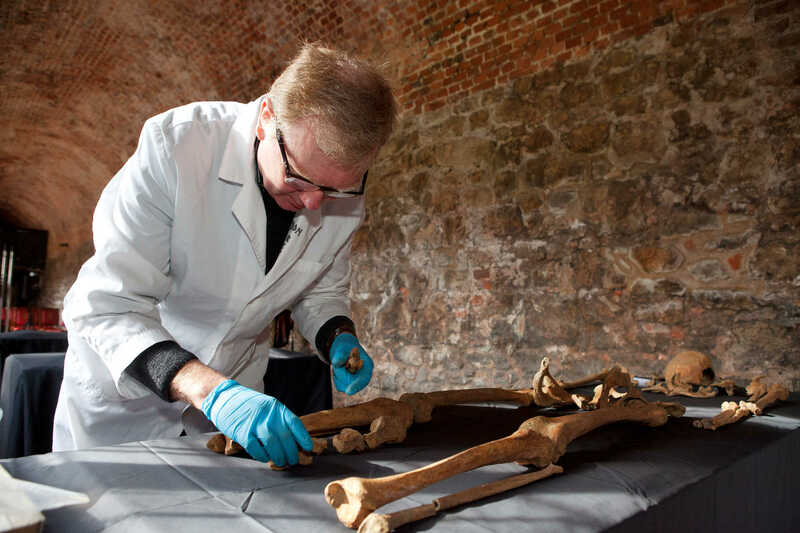 As at Liverpool Street, scientific analysis of a number of the individuals buried at Charterhouse was undertaken. Where possible, this included both a DNA and isotopic analysis. Although the sample number is quite small, some amazing details were discovered. The presence of Schmorl’s nodes on the vertebrae indicates damage to the back due to carrying heavy loads or undertaking strenuous work. This reflects findings at other London medieval cemeteries. Many of those tested had rickets which may indicate a poorer population. Isotopic analysis of ten individuals indicates that six probably grew up in London and four probably outside of London. Of these, one is likely to be from eastern England, two from central or eastern England, and one from northern England or Scotland. This shows that London in the 14th century was as much a magnet for people from elsewhere as it remains today. However, almost all those who had suffered health or nutritional stress in childhood were from London, indicating that life in urban centres was not always a good one. The majority of bone fractures occurred amongst those in the final phase of burials in the 15th century. Most fractures were to the ulna, one of the bones in the forearm. These may have been caused by work related or other accidents, such as falls, or by more violent means, such as when parrying a blow by an attacker.